The tee-shirt says,"WHERE IN THE HELL IS BELIZE?" on the front an "WHO THE HELL CARES !" on the back. And in 1982, I was one, who like many, had no idea or gave a darn if Belize existed. After fishing around the world, I was looking for a new and different place to soak a bait and catch something different. A good fishing friend in King Salmon Arkansas suggested this small Central American country. He said he heard that the fishing was great for tarpon, snook, and a variety of other salt water species and suggested that I check it out. So, I did! I lucked out in San Francisco. I found a travel agent who had been to Belize and told me the country was originally called British Honduras, was located just south of Mexico on the Atlantic Side, and was gifted with one of the world's great barrier reefs. 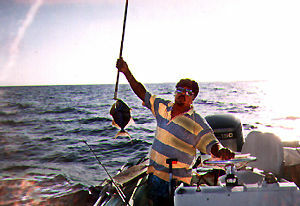 I purchased a ticket from him and in January, 1982 headed to my next great fishing paradise, Belize! After a long and tiring flight from San Francisco, I found myself in hot and steamy Belize City. The airline had lost my baggage, so I was forced to stay near the airport for at least a day. It soon become apparent that Belize City was not the port for my next great fishing adventure. Although the city is located at the mouth of a great river which empties into the Caribbean Sea, pollution has ruined any chance of catching a fish in or around the City. The next day my luggage arrived in Belize City and I was ready to catch a fishl I asked the girl at the desk of my hotel where I might expect to catch a few fish in Belize and she suggested San Pedro. She also said to look up Alan Forman at the Coral Beach Hotel since he really liked to fish. Since then, I really wished I could find that woman to thank her. Her suggestion started me on one of my greatest fishing adventures of this life. I then went to the local air taxi and booked a ticket to San Pedro, I really didn't even know where it was but soon learned that it was on an island north of Belize City and just south of Mexico. The town was located on an island called Ambergris Caye, 29 miles north east ofthe City, and just a few minutes from deep water and supposedly great salt water fishing. As the small plane left Belize City, I was immediately impressed at how fast the water below us cleared. Within 5 miles, the water appeared crystal clear with an occasional eagle ray swimming lazily along in water that appeared only a few feet deep. Then midway into the flight, I saw the barrier reef and the great white waves breaking over it. Beyond the reef was the deep blue water of the Atlantic and the big fish I had heard so much about... Then there was San Pedro, a town of maybe 2500 located right on the ocean with the barrier reef no more than 1/2 mile from the town. After landing, I asked where the Coral Beach Hotel was located and soon found myself checking in that hotel. Alan Forman greeted me with a big smile and asked me what I liked to do. I told him I was here to fish and wanted to catch something really big! No sooner had I said that, he saw someone walking past the hotel and hollered at this person, " Take this guy fishing." So, within an hour after my arrival in San Pedro, I was in a boat headed for the reef and maybe my first big fish from Belizian waters. 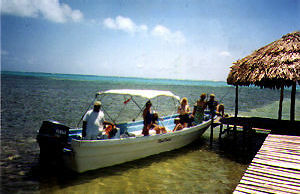 The reef which Belize advertises as the "world's second largest" stretches along the entire country but is most obvious in the northern part of the country. The reef starts in Mexican waters to the north and snakes its way south about 1/2 mile from Ambergris Caye. At low tide, parts are out of the water and even with low winds, there is enough wave action to make the reef very obvious. Inside the reef, the waters are shallow, averaging around 10 feet deep Outside the reef, the bottom drops off fairly fast reaching 80 feet about 1/4 to a 1/2 mile and 400 feet within a mile. Fortunately, there are some natural breaks which give fishermen and divers access to these deeper waters. There is a break in the reef directly in front of town, so we headed for that. The guide said we need live bait, so we first trolled a plain yellow jig and caught 3 or 4 yellow tail snappers about the size of your hand. (Most boats engaged in fishing have live wells designed to keep a few fish for bait. Most boats are locally built by master craftsmen from Belizian mahogany). With the live snappers, we headed through the reef and out to around 80 feet of water. (That's about the depth that you can still see the bottom from the surface and generally marks the drop off to the really deep waters). The technique was simple. Hook the snapper with a single hook through the snout followed by a treble hook toward the back end of the bait (using wire leader) and turn the fish loose to swim around in these beautiful blue waters. That day, like many to follow, produced results within a few minutes. The first strike resulted in a snapper cut in half just as clean as I could do with a sharp meat cleaver! What was down there? The second yellow tail was quickly eaten by something that really pulled and after fair battle, I landed my first barracuda - an impressive silver and sleek predator with a mouth full of teeth rivaled only by the northern pike or bull dog! After a couple more strikes and maybe another barracuda, we returned to San Pedro and I headed happily back to the Coral Beach with my catch in hand. Alan Forman filleted the fish and that evening, I enjoyed the flavor of fried barracuda with the Forman family. It really looked like I had found fishing paradise!